I’ve been too swamped to post the Thursday Top 5 on time for two weeks. Fortunately, no matter how busy I am, people still keep sending me funny and interesting stuff. A few of these below are recent finds, and a few are from the Top 5 archives. So here’s two weeks’ worth in one post, and I’ll try to be on time next week. Enjoy! Please design a logo for me. With pie charts. For free. As a follow-up to last week’s “How a Web Design Goes Straight To Hell,” James sent me this classic piece of humor. 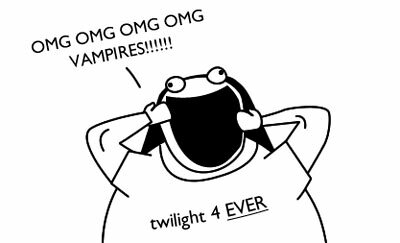 In case you want to know what the whole Twilight hoopla is all about, The Oatmeal has explained it for us. A cool prefab system. About / Photos. 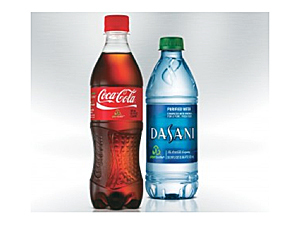 Coca-Cola has introduced the PlantBottle, a bottle made of PET plastic, 30% of which is sourced from Brazilian sugar cane and molasses. The company’s marketers will no doubt spin this as near to 100% “green” as they can safely get away with, and the vast majority of consumers will no doubt fail to note the difference between a bottle’s claim of “PlantBottle! 100% recyclable!” and the preferable goals of 100% renewable and 100% compostable. After all, the bottle is still 100% plastic, it's just that it’s partly plant-based plastic, instead of 100% petroleum byproduct. But, as GreenBiz columnist Marc Gunther notes, it’s a start. And a pretty good one. Thankfully, he’ll continue as judge and scorekeeper on “Wait Wait...Don’t Tell Me!”. Carl is awesome. Enough said. Wait it out until until about 1:20. You will not be disappointed. PS: I loathe the poseur Joe Lieberman and hope he dies a horrible, burning death. From the bizarre mind of illustrator Ryan Abegglen. 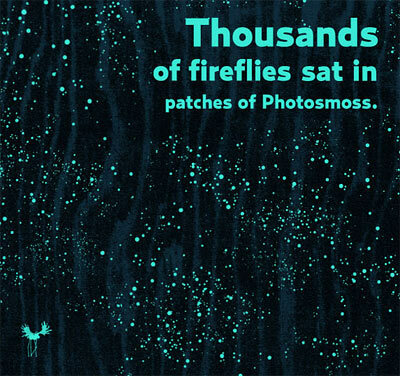 The weekly Thursday Top 5 lists the five most notable, interesting, funny, outrageous, cool, or simply strange things of the week. It is intended for distractionary purposes only. Do not take orally. If ingested, seek a doctor’s advice. If you like it, share it with others, or check out the long list of previous entries. 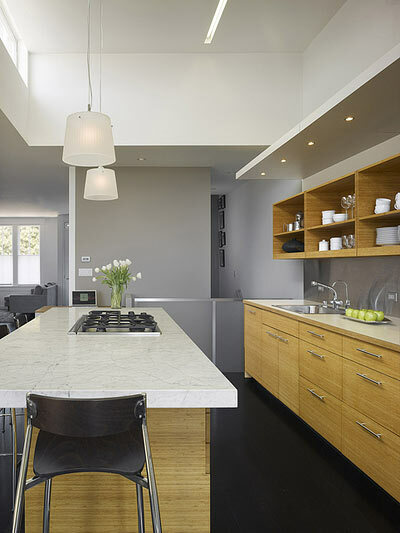 Slideshow of a Bernal Hill house that was renovated to modernize and double (!) its square footage. Here are some other Dwell slideshows. 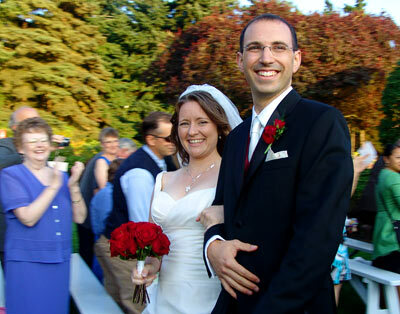 We went to Seattle last weekend to attend the wedding of our friends Patty and Rich, who met in Seattle but actually live in the Bay Area now. We stayed with our friends Chris and Jana, who used to live in the Bay Area but have since relocated to Seattle (Wedgwood, actually). Are you confused yet? The wedding was an opportunity for Velma to see some old college friends she doesn’t get to see very often. 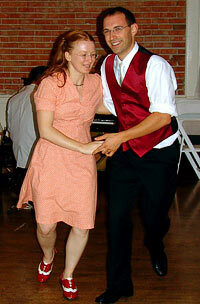 Rich was one of Velma’s best friends in college, and they were part of the swing dancing scene in St. Louis, and later in the Bay Area. Velma and I used to work in the same building as Jana, and Chris and Jana asked us to be the photographers for their wedding a few years back, in a park in the South Bay. They’ve since relocated to Seattle (Wedgwood), and were kind enough to put us up and show us around a bit too (I haven’t been to Seattle in over a decade). Not to mention picking us up and dropping us off at the airport! Friends can be awesome, can’t they? We spent most of our time in the Fremont District and Queen Anne, and Jana and Velma spent a solid chunk of time in World Spice downtown, behind Pike Place. 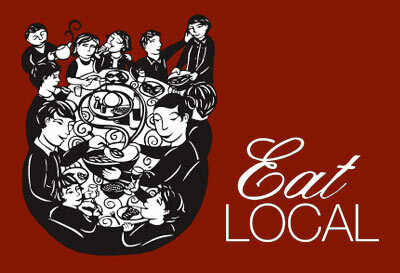 A cool organic café and grocery on Queen Anne Avenue N. They use local ingredients and make small batches that are perfect for couples or individuals to pick up on their way home. They also brew Stumptown Coffee. 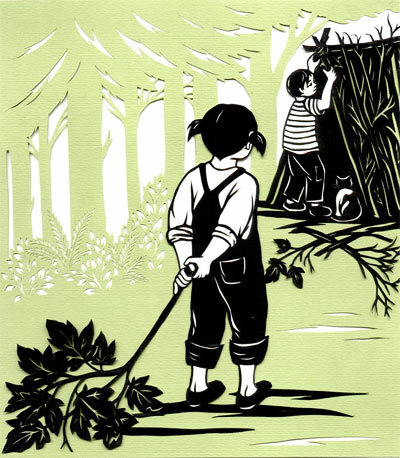 Nikki McClure makes extraordinarily beautiful papercut illustrations in a woodcut-like style. You may have seen her calendars or notecards, or recognize her work from books or magazines. We came across a whole bunch of her work (including a few framed originals, which are fascinating to look at up close) in the above-mentioned Eat Local shop, since she illustrated all their product labels. Update: Nikki has a show, “Vote for Survival,” coming to Needles and Pens on October 10. Needles and Pens is a really cool zine and DIY shop on 16th Street near Delores. 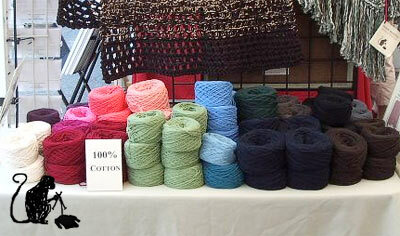 Leah Andersson recycles/reuses old thrift store sweaters into rehabbed yarn and new knitted items. I saw her booth at the Fremont Sunday Market. Chris took us to his favorite T-shirt shop. I really liked several of the designs, but since my travel bags were pretty stuffed and I didn’t want to spend much money on this trip, I decided I’d wait and maybe purchase from their website later. 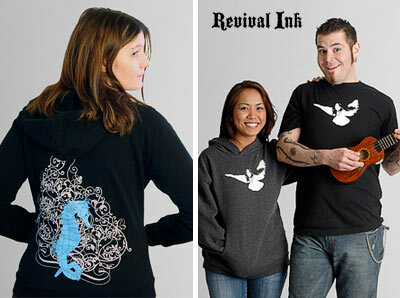 I saw this artist’s tees and hoodies at a boutique in Queen Anne and at the Fremont Sunday Market too. I liked two or three of the prints a lot, and would’ve bought one of the hoodies, but while they’re a more earth-friendly 70% bamboo and 30% organic cotton, they have those terribly cheap zippers that seem to jam within a month of use. Another of Chris’s faves, this shop features some exquisite artisan chocolates from around the world, and has free samples out all day. This is where the wedding was held, a lovely but slightly quirky historical building. 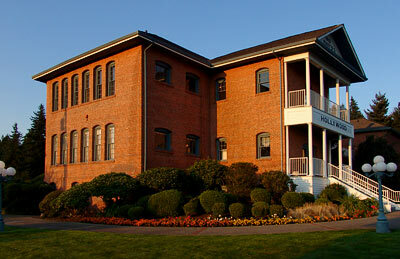 The 1912 brick structure hosts lots of weddings and banquets, and has some interesting decorations. This 19-acre park is on the site of a former coal-powered gas and oil plant, acquired by the city in the ’60s and opened to the public in 1975. 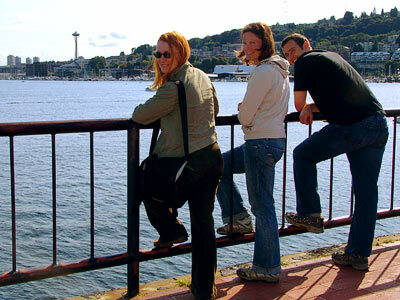 Right on Lake Union, in the middle of Seattle, the park features stunning vistas of downtown and the lakeside portions of the city (Velma, Jana, and Chris pictured above, enjoying the view). 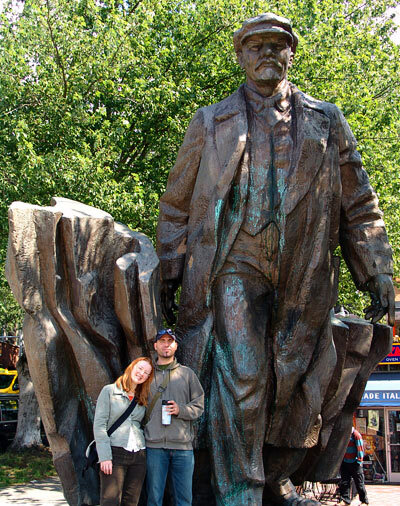 Since we were only a block away, we simply had to stop and see the 16-foot bronze statue of Lenin in the Fremont. Olya had told me about this (appropriately enough) a couple years ago; I hadn’t seen it when I visited Seattle my first time. If you have a spare quarter-million bucks, you can buy Comrade Lenin for your yard. He’s for sale. 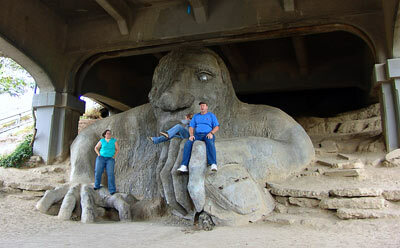 The other thing I hadn’t seen last time was the famous Troll. Somehow Holly and I entirely missed the Fremont neighborhood, although we squeezed in practically everything else in our three-day vacation about a decade ago. This popular spot behind Pike Place Market occupied Velma and Jana so long I had to walk around outside because the strong smells were becoming too much for my allergies. Most interesting to me was the Mongolian tea brick, actual bricks of tea which in the past were broken up to use as currency. 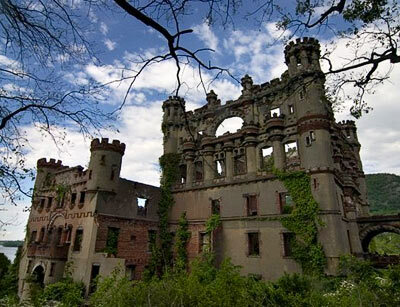 Tom Kirsch's hobbies include playing drums in a metal band, rock climbing, and taking lots and lots of pictures of abandoned buildings. His site, Opacity.us, concentrates mostly on prisons and mental institutions around New England, many of which have stood empty and decaying for decades. "Once a building no longer serves its purpose, and all of its functionality ceases to exist," he writes, "it becomes truly fascinating. Each room is transforming into something new at its own rate, yielding to the forces of nature as it reclaims man's creation." If you've seen much of my own photoblog, you probably know I have a bit of interest in urban decay too. On our recent New England trip, I spied a falling-down old brick building while we were driving through Rochester, New York, and I detoured back to take a bunch of photos of the exterior. If Velma hadn't been waiting patiently in the car for me, I would've gone in and spent an hour poking around and taking pictures in the half-demolished old structure. Blogger's added the ability to upload videos. I'm just testing to see how it works, and where the video file lives if you're hosting on your own domain, like me.